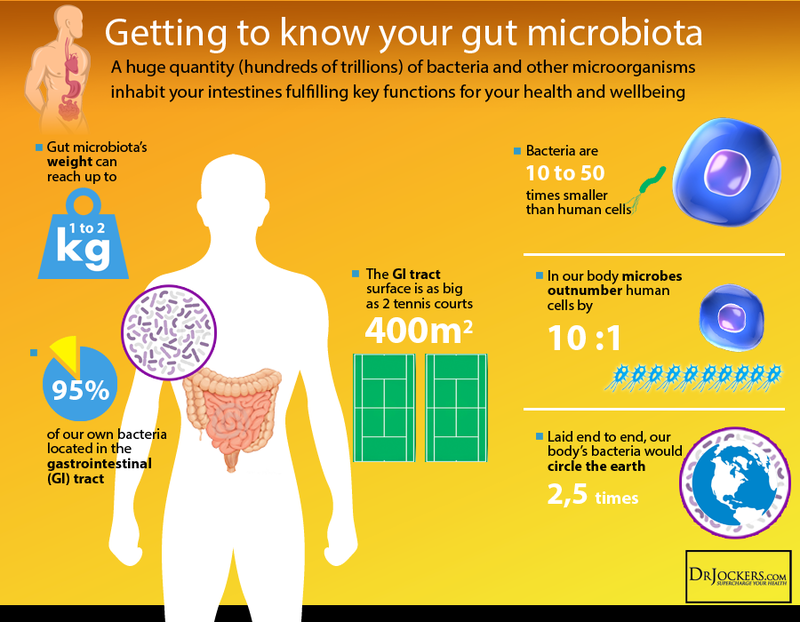 Gut flora is a term used to describe the trillions of microbes that live in our intestines. The most up to date research has revealed that the balance of our gut bacteria plays a large role in our metabolism. Many studies are even showing that changes in our gut flora are highly correlating with obesity and other metabolic disorders (4). Remember that girl that seemed to be able to eat EVERYTHING and not gain a pound? We always assumed that she just had a rock star metabolism. How many people do you know (you may be one of them) who has “done everything right” and still not lost weight? This weight loss resistance is becoming more and more common. Did you know that science says your gut bacteria is largely responsible for how fast or slow your metabolism is? Even better, what if I told you that we can manipulate your gut flora in order to enhance your metabolism? Of course, there are many lifestyle and diet factors that you can incorporate to lose weight and change your metabolism to a degree. Science is showing that if we can balance our microbiome, we can significantly change our metabolism and quit counting calories. The counting calorie method eventually turns into an exhausting and ineffective way to lose weight. As a matter of fact, caloric restriction typically leads to the body going into starvation mode and storing all of our intake as fat the best that it possibly can. This is not very effective for long term health and weight loss. This article will answer why the gut microbiome impacts our metabolism and how to correct the balance in order to speed up our metabolism. Discover how to rebuild gut flora metabolism. Extracts nutrients such as B12 from our foods. It should be noted that the only way to properly extract these fatty acids is by having the appropriate bacteria present in the gut. If we are lacking these bacteria, we will lack the ability to produce these short chain fatty acids and get the benefits that were mentioned above. Different bacterial species will convert the same foods into different end products. This means that if we have a harmful balance of gut bacteria, they can take foods, even healthy foods, and convert them into compounds that lead to fat storage, insulin resistance, gas production, and inflammatory compounds. Our original gut flora has a set metabolism and is highly responsible for our ability to lose or gain weight. It is also heavily influenced by our lifestyle and diet. Big influential factors include: antibiotics, chemical, processed foods, pesticides, herbicides, heavy metals, toxins, pathogens, medications, supplements, and anything else that enters into our digestive tract. Thankfully, this can be adjusted by introducing the proper bacteria into the digestive tract and feeding them the right foods to help them flourish and maintain a healthy metabolism (11). The gut flora breaks food down into nutrients. It can extract and create nutrients, but it can also rob us of nutrients when an imbalance is present. A healthy gut flora will extract short chain fatty acids, which have been proven to protect against diet induced obesity (4). The main short chain fatty acids found in the colon include butyrate, propionate, and acetate. Butyrate and propionate protect against obesity by stimulating the production of satiety hormones and reducing cravings, therefore decreasing the amount of foods ingested by the host. Acetate inhibits weight gain regardless of food intake and does not affect the gut hormones like butyrate and propionate do (4). Butyrate, a short chain fatty acid, has been shown to enhance adaptive thermogenesis and fatty acid oxidation (burning of fat). It has also been shown to improve mitochondrial function, increase insulin sensitivity, and reduce fat production (1). Butyric acid becomes sodium butyrate after coming into contact with sodium. Sodium butyrate is a common compound found in foods such as grass fed cheese, butter, and ghee. When these foods are consumed, sodium butyrate is then broken down into butyric acid in the body, which makes them a great source for this fat burning molecule. Butyrate is also produced from the fermentation process of foods high in dietary fiber in the large intestine. This process depends heavily on the types of microbes present in the large intestine as well as the dietary food sources. In short, butyrate can treat and prevent diet-induced insulin resistance by promoting energy production and enhancing mitochondrial function (1). In other words, butyrate is great for increasing metabolism and energy. It helps the body produce energy and reduce oxidative stress. Our gut flora creates a large amount of butyrate from foods high in fiber. Sources include produce such as broccoli, carrots, brussel sprouts, green peas, apples, oranges, and grapefruit (2). We must have balanced gut flora to reap the benefits of butyrate (1). Acetic acid is a naturally occurring acid found in produce such as strawberries, apples, grapes, pineapples, and oranges. This organic acid gives vinegar its distinct flavor and smell. It can also be found in fermented vegetables, grass fed cheese, and vinegars that are used for preparing foods. Studies have shown that acetic acid actually inhibits the accumulation of body fat and hepatic lipids. This is done without altering food consumption. It suppresses body fat accumulation by upregulating genes necessary for fatty-acid oxidation and mitochondrial processing (5). Acetate has also been found to have an inhibitory effect on the conversion of glucose to fatty acids in the liver. Treatment with acetate has shown a reduction in fat accumulation in adipose tissue, protection against fat accumulation in the liver, and improved glucose utilization. Based on these findings, research is suggesting that acetate is a promising compound for improving obesity and obesity linked type 2 diabetes (6). Another study found that not only did the intake of vinegar reduce obesity, but it also reduced serum triglyceride levels. This same study also saw that when the individuals stopped ingesting vinegar, their waste line and measurements went back to where they had initially began. This indicates that the intake of vinegar on a daily basis is necessary in order to maintain the anti-obesity effects (7). Propionate is produced by microorganisms such as megashpaera, veillonella, and selenomonas and without these organisms we will struggle to produce an adequate amount. Propionate is vital for utilizing glucose for energy in red blood cells. The presence of propionate has been shown to increase satiety and decrease the desire for sugar and overeating (4). How Do We Rebuild our Gut Metabolism? There are two forms of bacteria that have gained the most attention when it comes to burning fat. These two species include bacteriodetes and firmicutes. First, we need to address the ratio of these two species in the gut flora. A higher ratio of firmicutes has been directly associated with obesity, diabetes, inflammation, and metabolic syndrome. A higher ratio of bacteriodetes has been associated with healthier and leaner individuals (11). Here are 6 ways to improve your gut flora and favor the development of bacteriodetes over firmicutes. These steps will also create a healthier, anti-inflammatory environment in your gut and improve your nutrient assimilation. We can increase bacteriodete proliferation by feeding them foods high in fiber and eliminating sources of sugar. The key is to increase good quality fats, non starchy vegetables, and good quality protein. These foods should replace grains and sugars which are both high in glycemic index and feed candida yeast and harmful bacterial overgrowth. Artificial sweeteners should also be avoided due to their toxic effects. Firmicutes feed off of sugar and simple carbohydrates. These species are extremely powerful and can actually manipulate neurotransmitter production, which then cause your brain to crave sugar. We must eliminate their food source in order to starve them out of our system. This diet plan can still be satisfying and delicious when done correctly. Our focus should be on regulating blood sugar and having a good amount of satisfying fats and proteins with our vegetables and low glycemic fruit. Intermittent fasting is also beneficial for balancing the gut flora by increasing beneficial bacteria levels such as the bacteriodetes species we have discussed. It also increases human growth hormone levels which prevent fat storage. Begin by consuming all of your food in a 12 hour window. Keep 12 hours between your dinner and breakfast. You can then increase this to a 14-16 hour fast. The goal is to consume all of your calories within an 8-10 hour window because the microbes in our gut go through a cycle similar to our circadian rhythm. When we remain in a fed state, we prevent the recycling of beneficial gut flora. During the fasting period, be sure to super hydrate your system with water and organic herbal teas. Using lemon water and apple cider vinegar are also great for restoring gut microbiome balance. We must introduce the healthy bacteria into our gut in order for the species to take root and proliferate from feeding off of the healthy fibers, proteins, and fats that we are consuming. We use natural sources such as coconut water kefir, grass fed yogurt, kombucha, and fermented vegetables in order to introduce these bacteria. These are great food sources that should be ingested daily in order to maintain a good balance. Start with a table spoon in order to allow the gut to adjust Increase to 1-2 servings a day. SBO Probiotic is the probiotic that we start our clients on and typically see the best results with. This probiotic is full of bacteriodete species that are needed to convert and reap the benefits of our healthy nutrients. These organisms also contain natural antimicrobials that fight against parasites, fungi, viruses, and pathogenic bacteria. SBO probiotic also has spore forming bacteria present, which enables the microbes to naturally adapt to the harsh conditions of the GI tract. This means that they will not flourish until they have safely arrived to the proper place in the intestines. This probiotic also contains humic and fulvic acid that helps support the proliferation of the good microbes. These acids are major organic constituents of coal, lakes, ocean water, soil, and streams. They both act as anti-oxidants and electrolytes once inside the body and also bind and pull out toxic substances due to its chelating properties. I typically start my patients on one capsule a day away from food and supplements. This can be increased up to 4 in one day but I usually see results when using 2 capsules a day. In order to reduce the amount of firmicutes and other harmful pathogens, we use natural anti-microbials. Using herbs such as oregano, thyme, basil, and rosemary are essential for fighting pathogens. Garlic, onion, lemon, and apple cider vinegar are also great foods to use for fighting pathogens. GI Regulator is a concentrated form of natural antimicrobials and we use this for patients to reduce their microbial load if bacterial or yeast overgrowth is suspected. It contains Oregon grape root, which supplies berberine. Berberine is a plant alkaloid that has proven effective in killing pathogens. It also contains bayberry, formed from root bark of berry and bayberry, which contains astringent properties that help stimulate the maintenance of good detoxification (perspiration, stool formation, and urine production). Another ingredient in the GI Regulator is grapefruit seed extract. This compound contains very high amounts of antioxidants that reduce free radicals, phytonutrients, and pathogen killing molecules. Research has suggested that it is effective in killing over 800 bacterial and viral strains, 100 different strains of fungus, and even some types of parasites. Zinc is the last ingredient which is extremely important for regulating the immune system and supporting gut for a health. I will usually start patients on one capsule with every meal and increase up to two if necessary. Bone broth is great for building healthy bones, relieving joint pain, hair and nail health, healing the gut, fighting infection, reducing swelling, and removing arterial plaque. Liquid nutrition is more easily absorbable by the body as well meaning that we are able to extract more nutrients. For more extreme cases, I will recommend doing a bone broth fast that lasts 3-5 days. This should be done with the support of a health care provider. This gives the gut a break from digesting complex foods, which allows the lining to heal. It also provides nutrients to rebuild the gut lining and fight off harmful pathogens. This will significantly help fight off fermicutes and other harmful pathogens. You can use this bone broth recipe or use premade organic grass fed or pasture raised stock bones. Bone broth protein powder is also a great way to reap the benefits of bone broth without the hassle of making the broth itself. This is great for taking on the go and adding to unsweetened coconut milk. Many people have tried eating healthy but fail to lose weight or see results. A major cause of this is that their gut flora is favorable for turning fibers into hydrogen and methane gas instead of fat burning compounds such as short chain fatty acids. Many people have experienced eating a “super healthy” diet and only experienced gas and bloating as a result (11). Without changing the species present in our gut, the body simply continues to suppress weight loss, increase calorie absorption, increase insulin resistance, and increase gas production. With this approach, we are changing gene expression to favor a lean body. This approach is a much more powerful and permanent approach than the standard weight loss formulation of calculating calories in vs. calories out. This leads to enhanced fatty acid oxidation (fat burning) in the liver and muscle tissues and decreased production of new fat. Metabolic reconditioning is a very effective way to lose weight by changing our metabolism at the molecular level (9). 1. Gao Z, Yin J, Zhang J, et al. Butyrate Improves Insulin Sensitivity and Increases Energy Expenditure in Mice.Diabetes. 2009;58(7):1509-1517. doi:10.2337/db08-1637. 4. Lin HV, Frassetto A, Kowalik Jr EJ, et al. Butyrate and Propionate Protect against Diet-Induced Obesity and Regulate Gut Hormones via Free Fatty Acid Receptor 3-Independent Mechanisms. Brennan L, ed.PLoS ONE. 2012;7(4):e35240. doi:10.1371/journal.pone.0035240. 9. Caro-Quintero, A., Lizcano, F., Reyes, A., & Rodriguez-Castano, G. Advances in Gut Microbiome Research, Opening New Strategies to Cope with a Western Lifestyle. Frontiers in Genetics. (2016) 7: 224..doi: 10.3389/fgene.2016.00224. I’ve read a LOT of articles on this subject and this is the very BEST one. Thank you so much for reading Dana! Glad you found it informative! Amazingly helpful and thorough information and insight! Will share with my clients too. Just saying, Candida Albicans is not an “unfriendly bacteria”, it is an unfriendly fungus. Great article but it has been recently shown that a low F/B ratio is highly conducive to high levels of TMAO. My personal tests (F/B ratio < 6, TMAO = 58.2) corroborate that finding. What would you suggest as the best way to increase fermicuties? Wonderful article! I have recently had a GI MAP stool analysis done, for some reason I can’t get any doctor to run a SIBO test on me. The stool test is showing an overgrowth of Enerococcus faecium and Morganella spp., would you recommend any herbal antimicrobial to kill the overgrowth. My Firmicutes:Bacteroidetes ratio is very low (firmicutes 4.99e10, Bacteroidetes 3.46e12). Do you think a high probiotic/prebiotic protocol is enough?